….from our last night of our vacation. It is an awesome sunset (7/20/12) taken from the sand at the new Lava Lava Beach Club at A-Bay at Waikaloa on the Big Island! (Great place–we went twice!) I actually didn’t take the photo, but a lady (a local from Hawi) at the next table took it on her iphone, ran it through Instagram, and then texted it to me! The whole restaurant was taking sunset photos and even applauded when the sun finally set! Hope you like! Well, we don’t just like it, Jamie, we love it! Mahalo for sharing this photo and Hawaii vacation memory! 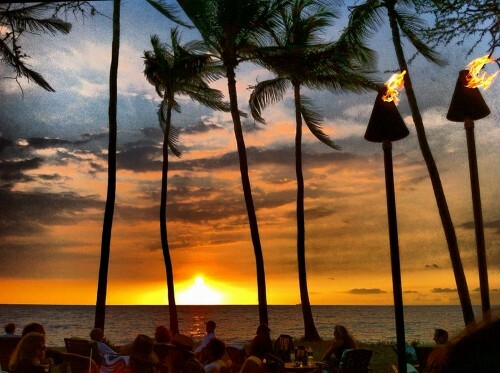 Do you have a Hawaii vacation photo that you’d like to share? See how you can submit your Aloha Friday Photo. Awesome photo! Makes me want to hop a plane and visit right away! Keep the great pics coming!